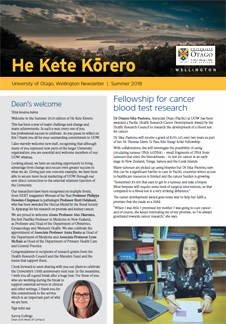 Welcome to the Summer 2018 edition of He Kete Kōrero, which highlights recent work at the University of Otago, Wellington. This issue includes a snapshot of work from our capital city campus, with stories on new funding for research projects ranging from investigating young men’s mental health to the potential of developing a blood test for cancer. We look forward to events taking place early in the New Year, including the Public Health Summer School and the landmark Cancer Care at a Crossroads Conference. And we make ready to celebrate as the University prepares for its 150th anniversary in 2019. Visit our news page https://www.otago.ac.nz/wellington/news/index.html for more news.